It all started with these – kale blossoms, they’re called, lovely slender green stalks with flowery ends, and the minute I laid eyes on the solitary bunch of them that remained at the NorthStar Farm table at last Saturday’s farmers’ market, I knew I’d be bringing them home. 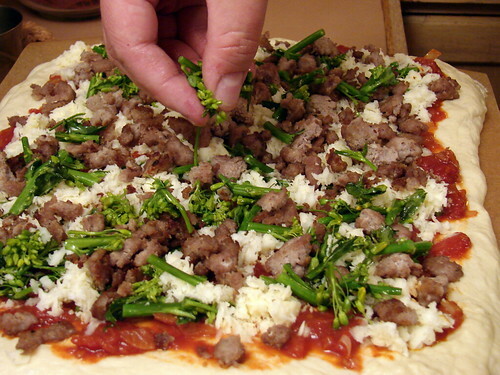 They looked so similar to broccoli rabe that I grabbed a package of sweet Italian sausage from Simmons Farm, too, figuring they would make a good pairing, and when we saw the limited edition “Pizza Mozzarella” at the Narragansett Creamery table, Tuesday night’s dinner was all but set. Mike made his standard crust and sauce recipes while I was at work, then sauteed the crumbled sausage once I had arrived home. The kale blossoms got a brief saute, too, just a minute with a slick of extra virgin and a pinch of red chile flakes, until the blossoms were bright green but still crisp. 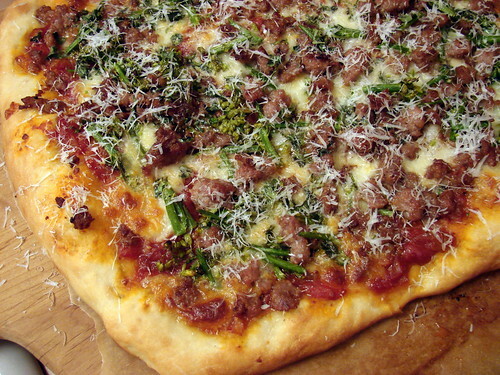 Sauce, cheese, sausage, and kale blossoms were layered on the crust and the assembled pie went onto a hot pizza stone. After a brief bake at 450, we pulled out our pie, added some chopped fresh oregano from Ledge Ends and a shower of finely grated Pecorino Romano, then once the risk of mouth-scorching had passed, we dug in. My guy’s got this pizza thing down. He really does have the pizza thing down. I still don’t own a pizza stone & peel. Of course, after reading this, I think I’m going to bite the bullet and just buy the stone finally. 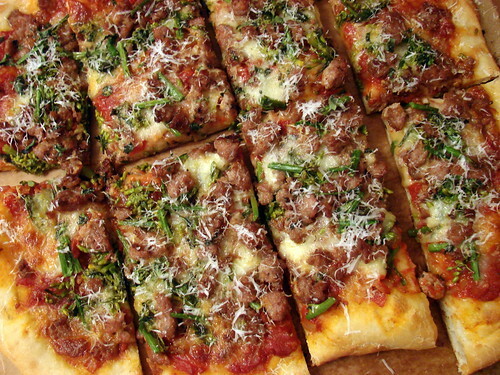 Pizza is probably my favorite food (as childish as it sounds). For me, it’s the ultimate in comfort food. The hell with somebody else’s restaurant, you guys should open your own! That pizza is a thing of beauty. 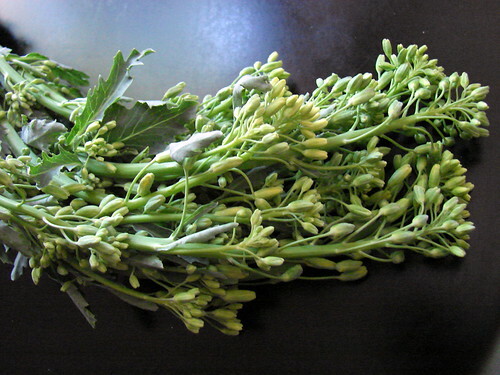 I’ve never tasted kale blossoms, so I’ll be looking for those at the farmers market. Your dinners always look so appealing! The kale I planted in some pots just grew these flowers. Now I know what to do with them. Thanks. merry jennifer – we’ve had that stone for years (I think Mike even had it before he met me! ), and we have gotten so much use out of it. The peel is incredibly useful for making grilled pizzas, too. And there’s something so satisfying about a homemade pizza. It’s great to know exactly what went into it! Lydia – Thanks! I had never seen these before last weekend, but I’m hooked! I hope we can get more on Saturday. healthierkitchen – Thank you! Glad we could provide some inspiration! I was standing in my garden plot this evening looking at the bolted kale and wondering if the blossom ends would be good to eat. Perfect timing! That pizza looks nice. Very nice. I have never even heard of kale blossoms before, but they look beautiful. I’ll have to ask around when my local Farmer’s Market opens for the season. Great looking pizza.